Finally, after all those years of enjoying each other’s music, the father and son teamed up to make what turned out to be an incredible project. 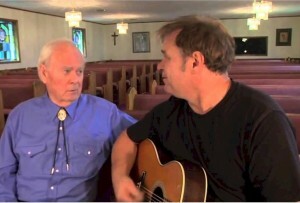 “Like Father, Like Son,” features songs both two men love and have always wanted to do, and both James and Jeff are featured on every song, while other pairs of father-son friends were also called in joined them on a few of the songs. Jonathan and Jordan Wilburn and Gerald and Jason Crabb are special guests, and the result is nothing short of amazing. Classic songs like “Down In The Valley” and a medley of camp meeting songs are included, along with some Easter Brothers hits, and the title song Sheri penned for the two. Thank you for subscribing! Please be sure to click the link in the email confirmation you will receive in your inbox. If you don\\'t see that in just a few minutes, be sure to check your spam folder.